Brooks-Range's new spring 2017 garment that reinforces the design concept of keeping your core warm. This ultimate layering piece can be worn as an outer layer or mid-layer. The durable Polartec Alpha provides more reliable protection than other synthetic insulation. Equipped with Power Wool lining on the back, the AlphaVest allows for better moisture movement when wearing a pack. Additional features: Lightweight 20d shell fabric, 20d Nylon breathable lining fabric, and easy-to-grasp zip pulls. Combination of Alpha Insulation and Power Wool make this an incredibly versatile pant for mid layer or outer layer protection. Power Wool in the lower leg and in the gusseted crotch help reduce bulk and increase stretch. With breathable nylon lining and a lightweight and quick dry 20 D shell, these pants serve as a perfect option for adventures when weight and space are limited. The Snooze 20 is dependable warmth in a premium 700-fill Goose Down bag. 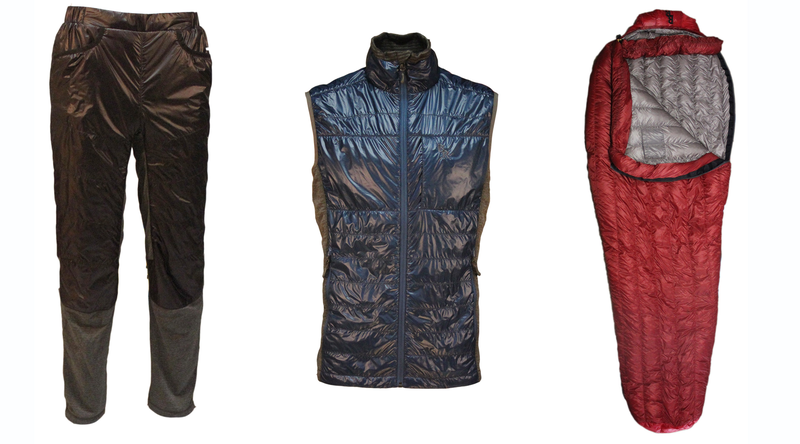 Highlights: water-repellent DownTek, Flow Construction, 20d shell and lining fabrics with DWR, and down-fill 3D collar. At $299.99 and 2lb. 2.5 oz, it’s the best price to weight ratio. Brooks-Range Mountaineering Equipment Co. offers an innovative, top-quality selection of backcountry and outdoor equipment, gear, apparel and tools for professional guides, recreational travelers and users alike for a safe and enjoyable mountain experience. Brooks-Range equipment is tested and trusted by their team of ambassadors comprised of the world’s top mountaineering, avalanche and outdoor experts. Designed with utility, comfort and safety in mind, Brooks-Range also promotes education and safety in the wilderness by supporting a variety of organizations. Mainly produced in the USA, Brooks-Range can be found at outdoor retail shops nationwide and online as www.brooks-range.com.